‘Even-so”- It is well with my soul. “It Is Well With My Soul” was written by a Church Layman, named Horatio G. Spafford in 1828. 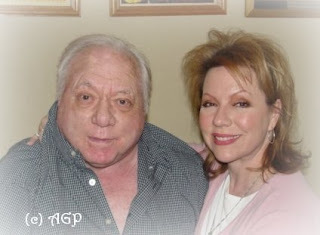 As a young man he established a very successful legal practice in Chicago. Even thou he enjoyed great financial success, he held fast to his Christian Faith as well as the close relationship he had with D.L. Moody and other evangelical leaders of that time. A few months before the Chicago Fire of 1871, Spafford had invested heavily in real estate on the shore of Lake Michigan. All of his holdings were wiped out by the disaster which came on the heels of him losing his only son to Scarlet Fever. Desiring rest for his grieving wife and four daughters, Spafford planned a European trip for his family in 1873. However, due to some last minute business developments, he was unable to travel. Instead he sent his wife and children ahead, promising to follow in a few days. Can you even imagine losing your entire family...all five of your children? My Mr. AGPMan and I were just a young married couple living in a small Texas town when we snagged our first piece of vintage furniture. If the truth be known we didn't have much more than a dime to our name so buying anything we didn't absolutely need was truly sacrificial. I mean...our goal was to buy and then EAT food! Simple as that! 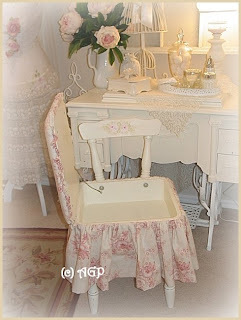 The vintage Sewing Chair you see above is another old piece I own-I actually have two! They are such sweet little beauties and they are impossible for me to pass up! I've sold a few (thank you Michele-my California friend) over the years, but because of their diminutive size it is difficult to part with them. They fit almost anywhere and I simply adore how they look once they are transformed! 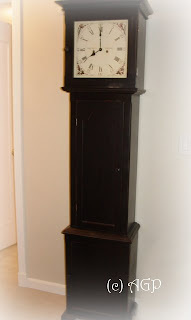 Check out this "before shot". Sweet, but nothing especially wonderful! But, after a quick sanding, several coats of fresh paint and some 2die4 fabric, beautiful old finds such as this one can be lovingly transformed for use in our cottage homes of today! We began by removing all the wooden pieces from the square base of the chair. Each piece was sanded down and primed and then hand painted (not sprayed). I opted to paint both the interior and exterior of the base (I did use spray paint for the inside). After the pieces were all dry and cured (at least three days or MORE! ), the chair was reassembled (except for the lid). 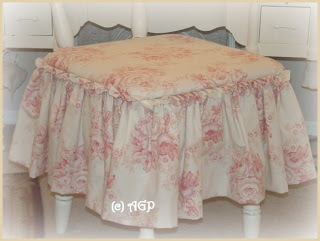 The flounce (skirt) was then attached with a staple gun (use upholstery strips for a neat, clean lines) up near the top edge. I left the inside of this one plain, but you can also line them with fabric! A tiny hand gathered ruffle was added to the lid after being re-padded with quilt batting (I opted to remove the vinyl cover on this part). 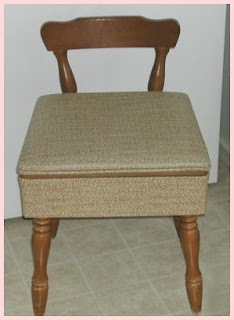 The inside lid cover was replaced and then it was re-attached to the body of the chair! 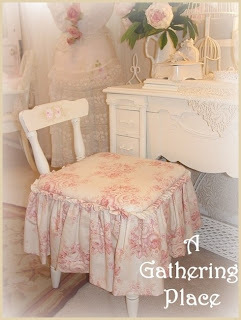 Lastly, shabby cottage chic roses (in pink, of course) were hand painted on both the front and back of the chair. Wahhhhhh Lahhhhhhhhh! Done! 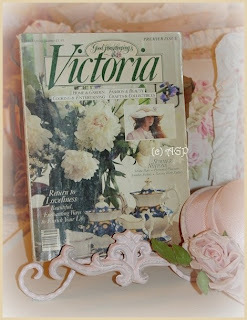 I placed this charming old find in front of a vintage sewing cabinet I found at yet another tag sale. 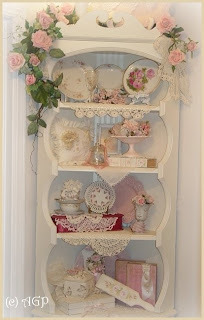 The circa 1920's cabinet is much, much older...but I still LOVE how they look paired together! A couple of years ago I found this fabulousHTML clipboard Tell City Bench (tag still underneath!) at an Oklahoma City Thrift Store for a good price. 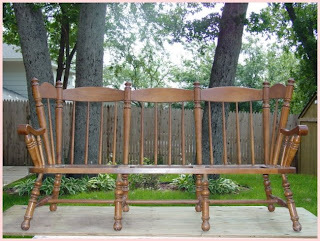 I could barely believe it because Benches like this lovely lady are almost impossible to find anymore! They are still considered high-end pieces and are highly sought after by many a collector!! Now-I have a great Hubbs...really, I do! But, I had a hard time convincing my Mr. AGPMan we had room for this spindally gal! To be honest with you, at the time I found her we were in the middle of planning our daughter's wedding and there wasn't a even a tiny bit of spare space in which we could squeeze her in. That didn't stop me from begging to bring her home tho... And, as you can see I WON the toss!! I convinced my guy to find room to store her until I could carve out time for the transformation! Last summer I dragged her from storage, sanded off her old varnish and gave her several coats of fresh cottage white paint! She is currently living in my shabby cottage style office and there isn't a day that passes that I don't find myself enjoying her company! You can't see this in the pictures, but her "seat" was once OPEN. My Hubbs re-strapped her (like webbing) and fluffy feather/down filled cushions were added making her sooo comfortable. "The Lord knows those who belong to Him"
Life sure has a way of teaching us some valuable lessons, doesn't it? 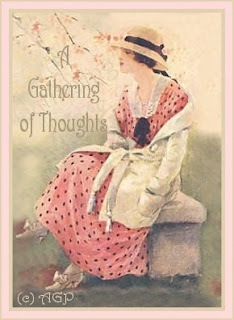 Lately I've been reading some of the writings from the well-known Christian Author, Max Lucado. His words minister to me and I never fail to be inspired by his wisdom and the powerful testimony he imparts. He speaks often of the grace and love of God...and of His forgiveness. I have a tendency to get hung up on my past mistakes and my list is a long one! "And I will remember their sins no more." BE STILL MY HEART... I truly thought I might faint! The beginning of this past week brought with it much anticipation!!! My hubbs knew how excited I was to place the vintage cabinet we found a couple of weeks ago (that fabulous 2die4 piece above) in her new corner! She sure needed a lot more work than I thought she was going to take to return her to her once glorious condition! 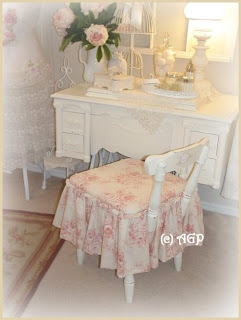 She is simply Shabby Cottage Chic WONDERFUL now! Couldn't wait to share with you the details of her transformation! This gal's makeover list is a tad lengthy! Hubbs had to do a little repair to her dainty spine, a bit of wood filler was needed to camouflage some scaring left by shoddy nail removal, a good sanding off of the old oil-based paint was absolutely necessary as well as a thorough cleaning! 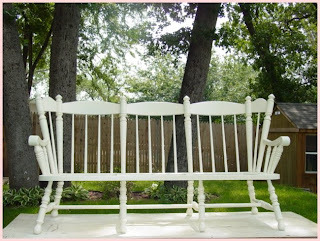 Once she was sturdy and strong she was given three generous coats of fresh cottage white paint! Taaah Daaah and WHOOOO HOOOOO! Newly decorated with some of my favorite finds, I'm proud to have this beauty in my home. She was originally handmade with great attention to detail and I suspect she will stay right where she is for many, many years to come! Hope you love the peek at this charming transformation! Isn't it a blast to turn something that has lived past it's prime into something functional again? I think so!!! One of the greatest privileges in my life has come from being the mother of a beautiful daughter. My girl’s name is Adrienne, and she is truly one of the most kind and gentle people I’ve ever known. If she wasn’t my daughter I would choose her as a friend. 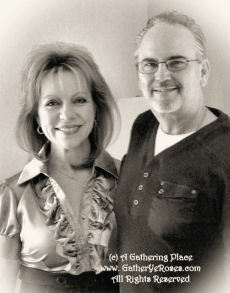 In the 24 plus years she’s been in my life I’ve never known her to intentionally hurt anyone. She has a heart of gold and carries upon her young shoulders more burdens than I even begin to share with you… During my entire life she has never failed to bless me for deep inside her she shines with the presence of the Lord. I struggled at first to understand the words on the other end of the phone. 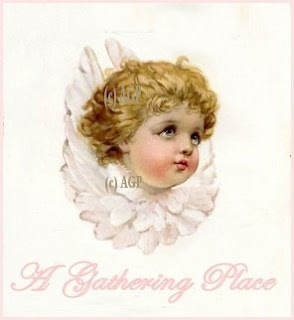 My first thought was that deep sadness had overcome my girl as both she and her hubbs attended the funeral this morning of his beloved Aunt Anne… She had passed earlier in the week…much too young to leave this earth. Still…her sorrow seemed compounded by more than death and I wasn’t sure why… So…I continued to listen. I shared with you all last week that my hubbs had to travel out of town for business. He made a quick trip down south to Little Rock, Arkansas, and I truly wish I could have gone with him! We lived in the state for a few months right after we were married and the countryside was easy to fall in love with...the land is amazingly beautiful! 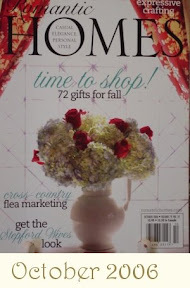 My Mr. AGPMan knows I simply adore vintage homes. I can't pass one by without begging to stop for a roadside visit. Since I couldn't join him on his business jaunt he took it upon himself to watch out for those sweet old homes for his high-maintenance, pink rose lovin' gal! 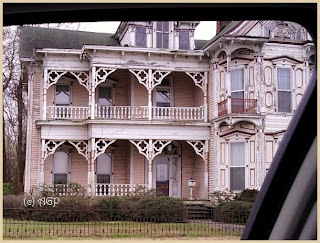 On his way through Pine Bluff he passed this charming PINK Victorian and couldn't resisit snapping a picture for me. Pretty good for a camera phone, huh? 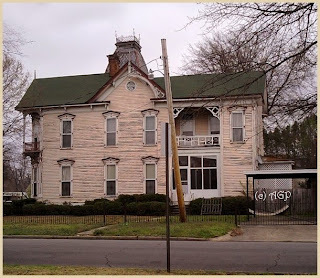 Even though the gorgeous old home needs some TLC (and probably some seriously big bucks! ), I would love to make it mine... The next time my guy makes his way to Arkansas you can believe I'm going to be with him! Couldn't resist showing this beautiful pink beauty off to you! Hope you love it, too! Even though I've been missing in action over the past few days I've been busy working! With my hubbs out of town last week I took some time away from stocking my website (new pretties coming this week!) to work on a FEW personal projects that I started several months ago but remained half finished. I couldn't wait to show you the end result of something that truly proved to be cottage wonderful...at least I think so! 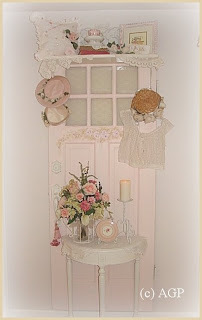 The beautiful old door you see was once the back entrance to the French Style Cottage that once stood dainty and proud! It's been totally re-purposed and now is proudly displayed in my upstairs landing! Because our landing is fairly small we had to come up with a decorative find that was both functional and narrow. 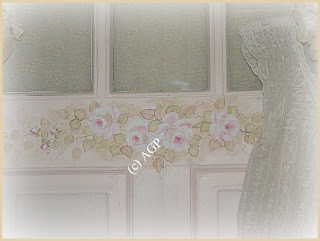 Across the front I hand painted a spray of fluffy pink roses and soft leaves in basil and pale fern. 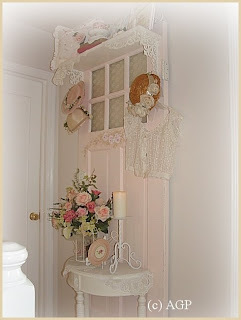 All the original hardware was in place making the door an even sweeter find! Hope to share more with you later this week! 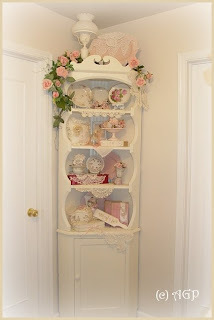 Don't forget that gorgeous vintage corner cabinet is coming up soon! 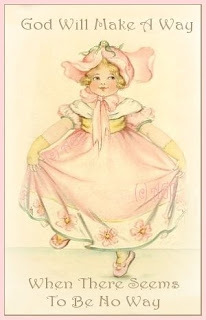 Now that's a sweetie and a real treasured find for sure! Be creative, challenged and changed! Make no mistake about it...I KNOW, KNOW, KNOW I'm blessed! 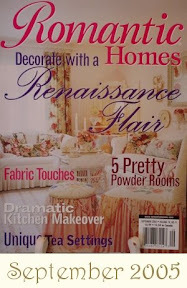 Over the past few weeks I've been busily working refurbishing pretty finds for my home. Aside from reopening my website and working towards keeping it stocked, (head's-up... I'll be uploading new painted pretties during the day tomorrow) , I've made a commitment to whittle down the things in my storage shed. Even though I don't make New Year's Resolutions (for the obvious reasons), I do set goals for myself each year. Starting last January I scheduled something to complete each month and so far I'm right on track! This is HUGE for me because my head is always spinning away with ideas. It's easy for me to lose sight of why I even bought something if I'm not careful. This shot was taken at the top of my stairs (see the banister?). The room you see is our guestroom. 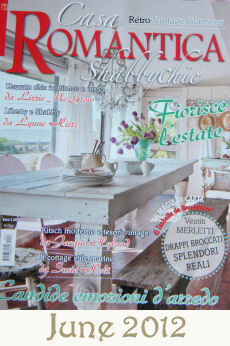 This room was in Romantic Homes Magazine (2006) but has since be redecorated. Love it even more now! Change is good! 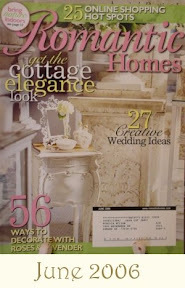 Even when decorating in Shabby Cottage Chic style, every now and then I believe an update is sometimes necessary! 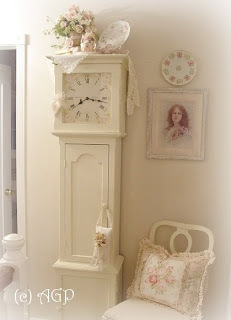 I painted the entire clock with a sponge brush a soft cottage white. 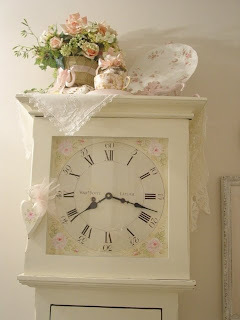 The face of the clock was removed and in the corners I hand painted pink roses! 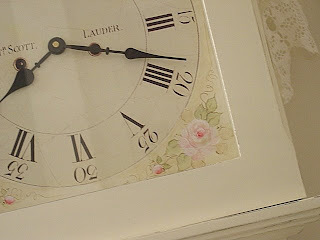 I opted not to paint roses on the front of the clock's body (doors). 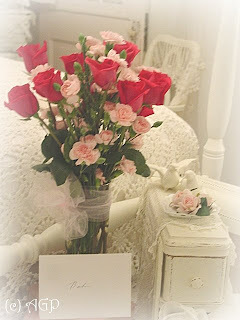 As much as I love PINK ROSES (And I do! I DO! ), sometimes I just think less is more...you know? 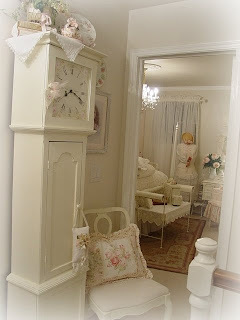 Besides, I'm really wanting to hand paint some sweet little roses on the wall and if I also paint them on the clock, well...for me it will just be too much! I left the original numbers and lettering on the clock's face in tact. I painted out the decor in the corners and replaced it with my own artwork! 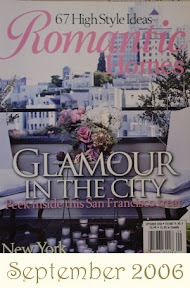 Hope you enjoyed a peek into my home. The closer we get to Spring I promise to upload more pictures, including those of the outside. I think it's lovely! 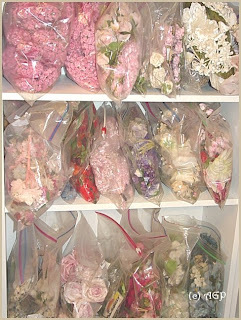 One of the greatest joys I have comes from the making of handmade pretties. 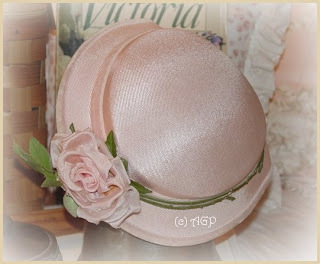 Aside from my love of painting PINK ROSES, I simply love working with fine old laces, linens, charming vintage ribbons, buttons and the ever lovely, (and getting harder to find), vintage millinery flowers and blooms. Creating new works of art from snippets of the past just seems to call out to me… Repurposing old finds has easily become my passion. I just can’t resist the allure of an old keepsake I know was once dearly loved. 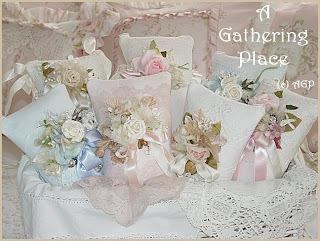 Why not try your hand at fashioning a Sachet for your own Momma (don’t forget that loving MIL), sister or friend? 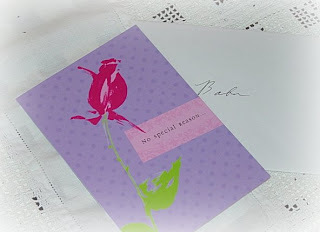 They aren’t nearly as difficult as they may seem and are gifts that will last for years and years to come. Those you love will greatly appreciate the effort and time spent creating something with your own hands! Left alone to wander about I found myself eagerly walking down each aisle and visiting every booth. Weaving through a maze of interesting old finds and quite a bit of junk, my eyes were looking for the “good stuff”. However, while moseying slowly down the last row my eyes fixed upon something I hadn’t seen in years. 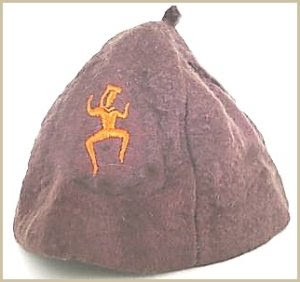 A Brownie Beanie like the one I wore during my Girl Scout days. I was instantly, frightfully pulled me back in time. 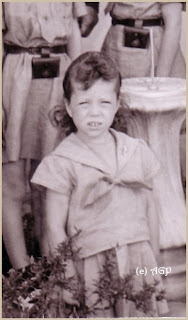 Back to the worst days of my childhood…back to being eight years old and attending elementary school on the Texas Coast. Back to third grade life and sitting under a wench of a teacher named Miss P…back to the year 1967…back to living life in a parsonage built on top of a church…and…back to the year I met Delores. I don’t remember much after that except running as fast as I could to our modest home in hopes of convincing my mother to wash my Beanie. AND THE AWARD GOES TO...Me? No Way! 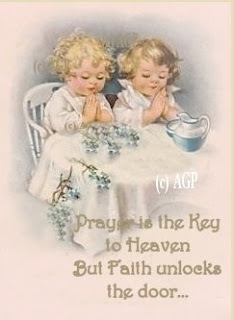 My beautiful friend, ~TeaGirl~ and my sweet friend Mary at "Isabella's Closet" both passed this sweet award onto me! Thank you so much! Still learning the tricks of the trade ladies... there is still so much I don't know! List 7 things that you "Love" and then pass this award on to 7 Bloggers that you love!Be sure to tag them and let them know they have won! You can copy the graphic by clicking onto the Award Icon and then placing it on your sideboard. 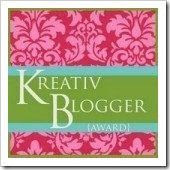 This lets the whole world know that you are KREATIV! 2. I love my family- Bran, Adrie, Mr. AGP, Micah, Sarah & Miss K.
4. 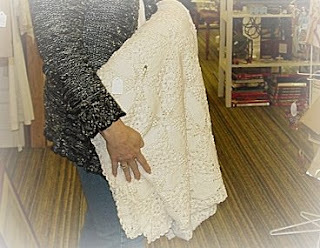 I love to shop at Second Hand Stores, Estate Sales, etc. 5. 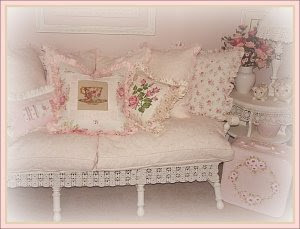 I love to decorate my home in shabby cottage chic...yum! 6. I love to entertain & host small dinners for close friends.. 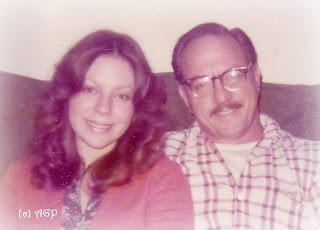 Tomorrow my father will celebrate 79 years of living on this planet and more than ever I’m grateful he is still with me. Life hasn’t been easy for the man I still call “daddy”. I use to spend a lot of time concentrating on his many imperfections… but, now that he is ill I try not to waste a second speaking of things that are impossible for me to change. Instead, I choose to celebrate the things he did that were right and pray for my heart to lead me as I work out the details of everything else. Over the weekend my hubbs and I took a little drive to our old college stomping grounds to do a little shopping! 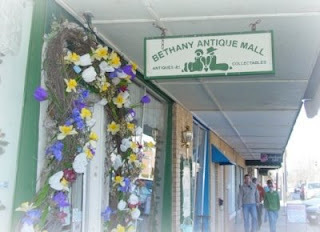 Bethany, Oklahoma, is about 20 miles from our home and truly has some wonderful little Antique Stores and Thrift Shoppes where one can make for a fun day of shopping! The stores always seem to house the most interesting finds and I never come away empty handed. They seem more than happy to take my money, too! Several years ago, long before my eBay days, I rented a little “nook” inside one of the Shoppes off Main Street. 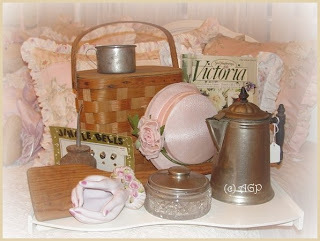 I sold mostly vintage linens, handmade pillows, pretty rose dishes and even some painted furniture. 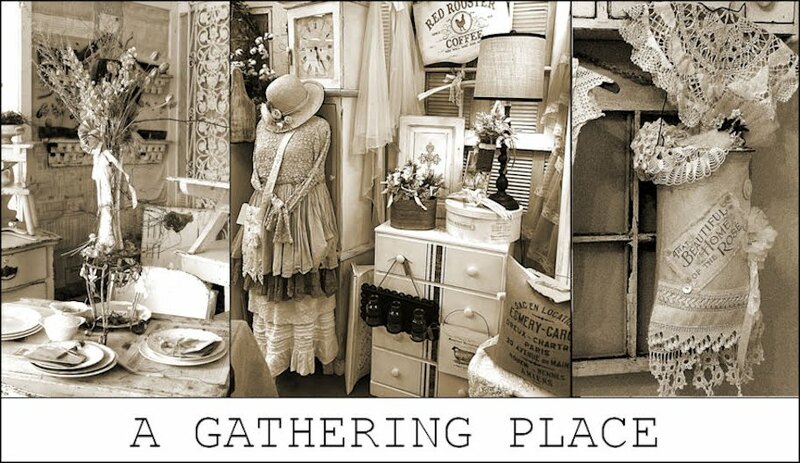 I loved those days of peddling my wares and had such a wonderful time decorating my space. 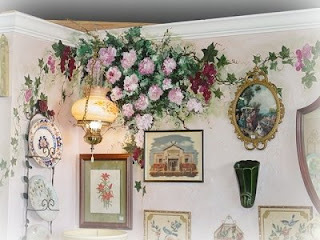 Even now when I visit the room I once leased it’s fun to see the painting of pink hydrangeas and rosey-pink grapes I painted on the PALE PINK WALLS! The artwork is still there after ten years! I’ve included a picture of how the room looks now for you to see…TEN YEARS ago…Wow! On this trip I found the most delightfully sweet things! 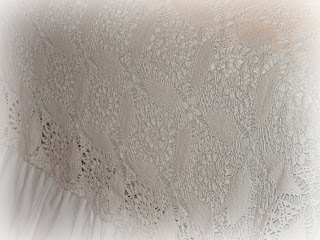 My favorite though has got to be the gorgeous hand crocheted, natural white coverlet I snagged for $26. I couldn’t wait to bring it home and try it out for size! It is fabulous…no holes, pulled threads or stains! What a steal! My hubbs snapped a picture of me holding onto it for dear life! 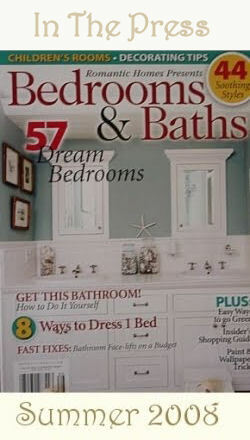 I’ve included the pics and one after the spread was freshly laundered and layered on top of my four poster bed! Hope your weekend was as fun and exciting! Did you find anything wonderful? Promise to share more soon!